Work has already begun on the January 2017 MAPPS Winter meeting in Palm Harbor, FL. MAPPS will once again present a track for business owners and senior managers that contains important content about business and technology. But once again they are working to establish a second concurrent track designed for emerging leaders within member firms. This track will concentrate on a few day-long courses that help our younger managers go deep to learn important skills they can immediately apply within their firms. These courses are the first part of a three-year curriculum for the “Emerging Leaders” courses. 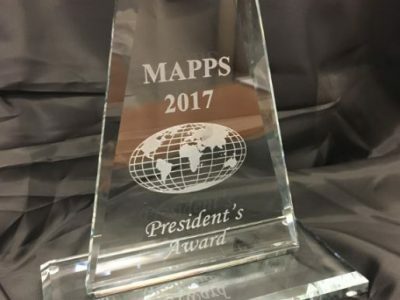 MAPPS members have recognized they need an excellent resource for acquiring important training on leadership, ethics, business management, and project management all tailored for the geospatial businesses that member firms are engaged. Thank you Mike for getting right things done well! About MAPPS. 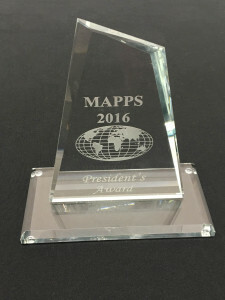 MAPPS is the only national association of firms in the surveying, spatial data and geographic information systems field in the United States. MAPPS member firms are engaged in surveying, photogrammetry, satellite and airborne remote sensing, aerial photography, hydrography, aerial and satellite image processing, GPS and GIS data collection and conversion services. Our associate members include firms that provide products and services to our member firms, as well as other firms world-wide. Download the informative MAPPS brochure here.